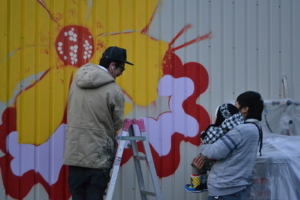 I’m here in Ishinomaki for the project “Community X Graffiti @Ishinomaki” hosted by the Japan Foundation. I’m going to report what’s going on in Ishinomakki now. 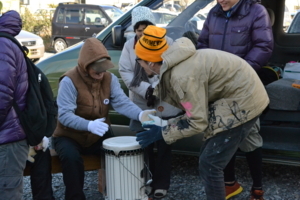 This event was scheduled to begin on December 3, but it was raining on the day, so the event was postponed to the following day of December 4. I took many pictures of graffiti drawings, so have fun looking at some of them! How do you feel? They are so beautiful, aren’t they? They’re so appealing even though seen from a distance. 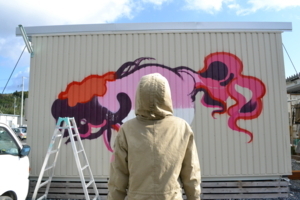 People passing by gazed at the drawings while driving cars. Maybe we should make caution signs to avoid car accidents. Ha ha ha! 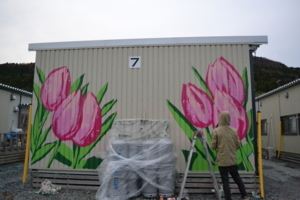 It is our Titi who has been drawing such cool graffiti drawings on the walls of temporary houses. You might imagine a groovy Brazilian gangster from his drawing style and his portrait on the blog site, but actually he is such a nice guy who loves his son verrrrrrry much! Titi is perfectly welcomed by the residents. Yo-yo master Titi is surrounded by kids after school, and some men come and see him drawing graffiti during the daytime. Moms bring him some snacks or sweets. He is soooo popular among the residents! 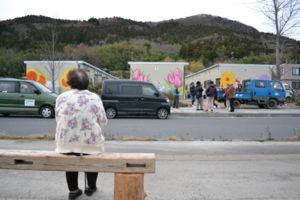 It was warmer yesterday, so a number of residents visited him or stopped by to see his drawings. 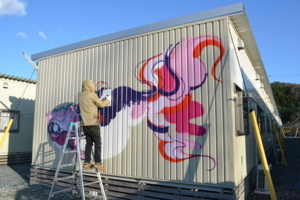 This graffiti drawing project aims to attach unique identities to temporary houses. Another big goal to be kept in mind is to provide the residents of the community with an opportunity for communication. So many people came to the event yesterday. 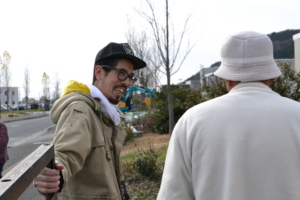 At first, the residents talked to Titi or staff working thereby, but then they started to chat at the event site. 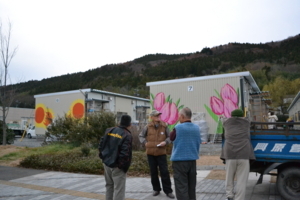 This is the interim report from Ishinomaki! 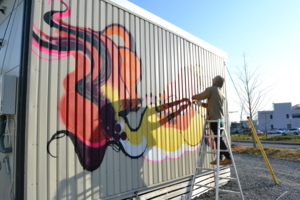 Information on this graffiti drawing project is being updated on Twitter and facebook as well. Don’t miss it!